Will you be stronger than the game? 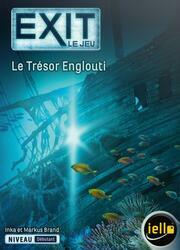 (beginner level) Embark on a dangerous adventure in search of the legendary Santa Maria treasure. While exploring the mysterious wreck, something unfolds terribly wrong and you find yourself trapped in the underwater depths! Will you be able to solve the riddles of the wreck and find the treasure before your time is up? EXIT is a game that takes the feelings of "escape games". Equipped with clues, hardware and a decoder, you will have the mission to get out of the game as quickly as possible. More than a game: a unique and immersive experience in which you will have to show cooperation, observation and logic.